It is necessary to have appropriate laboratory scale fermentation systems in order to study the biochemistry that underpins brewery fermentation, to assess the properties of individual yeast strains, to screen and select new yeast stains and to develop novel processes. 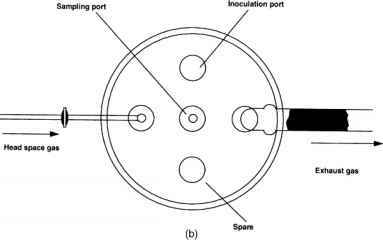 Much of this work may be carried out using conventional laboratory apparatus. This may range from the simple Erlenmeyer shake flask to the highly sophisticated fermenter fitted with a plethora of sensors and control devices capable of continuous monitoring and regulation of most process variables. A description of such apparatus may be found in any general text describing the methods used for the cultivation of micro-organisms. This general purpose apparatus is designed for growing yeast and other microorganisms principally under aerobic conditions and this usually involves some form of agitation to promote oxygen transfer. In order to study the behaviour of yeast under conditions comparable with a brewery fermentation, namely transient aero-biosis and lack of mechanical agitation, some specialised apparatus has been developed. Mini-fermenters are a simple and inexpensive method of carrying out multiple small-scale fermentations under controlled conditions (Quain et al., 1985). This approach allows simultaneous operation of several tens of fermenters. They may be conveniently used for screening the fermentation performance of many yeast strains under identical conditions. Alternatively, they may be used to study the effects on a single strain of varying conditions such as pitching rate, initial dissolved oxygen concentration and wort composition. They consist of 120 ml glass 'hypovials' (up to 100 ml operating volume) fitted with gas-tight butyl septa held in place by metal crimped caps. Gaseous exchange is achieved via inlet and outlet tubes, each fitted with sterile filters made from cut down Pasteur pipettes, attached by silicone tubing to hypodermic needles the tips of which pass through the septa (Fig. 5.48). The contents of each hypovial are stirred using magnetic followers. Attemperation may be achieved by placing the fermenters in a suitable temperature controlled room. Alternatively, the vials may be partially immersed in an attemperated water bath. In this case, it is convenient to use multiple place immersible magnetic stirrers. Fig. 5.48 Hypovial mini-fermenters (from Quain et al., 1985). achieved by purging the headspace with an appropriate gas (air, oxygen, nitrogen or carbon dioxide). 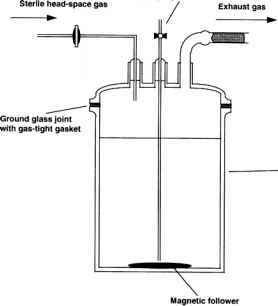 This is facilitated by connecting each inlet tube to the gas supply via a manifold and controlling the flow rate by the use of a rotameter. During operation, the progress of the fermentation may be conveniently monitored by recording weight loss at appropriate intervals. Alternatively, or in addition, multiple identical sets of fermenters may be used from which individual vials may be broached and analysed at intervals, as required. Mini-fermenters can be usefully applied to studying the effects of varying the initial oxygen concentration on fermentation performance of individual yeast strains (Boulton & Quain, 1987; Bamforth et al., 1988). Here, the hypovials are calibrated with a volume scale. Prior to filling, the air is displaced from each vial by sparging with sterile nitrogen and the yeast inoculum is added. Sterile wort is dispensed from two reservoirs, one made anaerobic by sparging with nitrogen and the other saturated with oxygen. 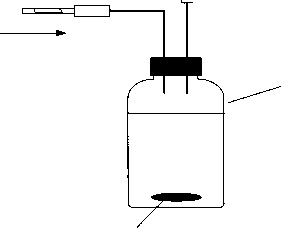 Addition of a proportion of wort from each reservoir, using the volume calibration scale on each vial, allows the establishment of a gradation of initial dissolved oxygen concentrations. Mini-fermenters are useful where relatively large numbers of individual fermentations are to be performed. They are, however, cumbersome where several samples of reasonable volume require to be removed for off-line analysis during the course of the fermentation. Parameters monitored include yeast biomass, specific gravity, ethanol and, depending on need, flavour 'volatiles' (esters, higher alcohols, etc.). These analyses would require a sample size of the order of 30-50 ml. Clearly for this to be achieved a vessel with a greater capacity than the mini-fermenter is needed. Preferably, a relatively unsophisticated design should also be retained in order to allow multiple fermentations to be performed at reasonable cost. A low-cost fermenter that fulfils these requirements is illustrated in Figs 5.49(a) and (b). Vessels are glass with a capacity of 2.5 litres (2.0 litres working volume). The joint between the vessel body and lid is ground glass and has a silicone rubber gasket to maintain a gas-tight seal. The joint is held together with a screw and wire clip arrangement. Ports in the lid (five in total) are of the Quickfit type. The seal between the port wall and fitting is made gas-tight by the use of Teflon liners (silicone grease should be avoided). Ports with no specific fittings are closed using glass stoppers. One of these is used for adding the yeast inoculum to the wort. Like the mini-fermenters, magnetic stirring ensures homogeneous conditions and attemperation may be achieved using a temperature-controlled room or by partial immersion in a temperature-controlled water bath. Fermenters may be used in multiples, usually 6-12 being most convenient to handle at any one time. Prior to inoculation, the wort may be air-saturated simply by equilibration with the atmosphere. This is facilitated by vigorous stirring of the unpitched wort. For greater than air saturation the wort is sparged with sterile-filtered oxygen through a glass sinter fitted to one of the spare ports. During fermentation, anaerobiosis is maintained by flushing oxygen-free nitrogen through the headspace. As with the mini-fermenters, a manifold system and rotameter arrangement are used to deliver gas at an appropriate rate to each fermenter. Appropriate sterile filters, located in the gassing and exhaust lines, provide a microbiological barrier. Small scale stirred laboratory fermenters are useful where it is important to maintain homogeneous conditions within the vessel. Such an approach offers more precise control over the conditions within the fermenter. However, it does not mirror what happens in a production scale vessel and it is recognised that efficient stirring tends to promote yeast growth. Consequently, crop sizes are usually significantly bigger than those obtained from unstirred fermenters using identical combinations of wort and yeast. Altered patterns of yeast growth brought about by stirring will also influence the production of metabolites related to growth. When designing experiments, these caveats must be borne in mind in choosing a fermenter most suited to the particular avenue of investigation. In order to study some aspects of yeast growth and fermentation it is necessary to use fermenters where, as in a production scale vessel, the activity of the yeast provides the only source of agitation. For example, when studying the flocculence characteristics of yeast strains, in particular, whether they are top or bottom fermenting. The industry standard fermenter used for such investigations is the 'E.B.C. tall tube' (Institute of Brewing, 1997). Fig. 5.49 (a) Simple stirred laboratory fermenter. (b) Top view. to a hypodermic syringe of appropriate size. The top of the tube is closed using a foam bung. Tall tubes, each holding 2 litres of wort, are commonly used in sets of 12 fitted to racks on a trolley. Coolant, which is usually water, may be pumped from an attemperated bath through the jackets of each tall tube in a closed loop. The tubes are sterilised empty by treating with a disinfectant, or preferably with steam for a minimum of 30 minutes. Wort is collected into a separate flask and aerated or oxygenated by vigorous stirring and/or sparging. In order to ensure good dispersion, the yeast inoculum is added to the flask prior to aseptic transfer into the tall tube. Using tall tubes, all conventional features of a brewery fermentation, such as suspended yeast count, ethanol concentration, rate of decline in specific gravity, etc., can be monitored by analysis of appropriate samples. In addition, the composition and flavour of the green beer can be assessed at the end of fermentation. Perhaps most importantly the technological behaviour of individual yeast strains can be compared by direct observation. More sophisticated versions of the simple E.B.C. tall tube have been developed. For example, Sigsgaard and Rasmussen (1985) working at the Carlsberg Research Centre in Copenhagen, Denmark, described a system of 60 x 2 litre tall tubes. Termed the 'Multiferm', it was originally introduced to evaluate the fermentation performance of genetically modified yeast strains. The system was entirely automatic, all operations being controlled by a microcomputer. The latter also functioned as a data-logger. Individual tubes were constructed from stainless steel and attemperated by circulating coolant through external jackets. At the top of each tube, a valve arrangement allowed a single aperture to function as an exit for evolved carbon dioxide during fermentation and as an entry point for CiP. The base of each tube terminated in a stainless steel container, which could be lowered, automatically, to allow access for yeast inoculation, prior to wort addition and removal of the crop after fermentation. A tube passing through the wall of the vessel, close to and directed towards the base, was used for wort addition and removal of beer at the end of fermentation. During wort addition, the downward flow ensured that the yeast inoculum was resuspended and dispersed. Each tall tube was fitted with a sample point, roughly halfway down the vertical wall, consisting of an aperture closed by a silicone rubber membrane. Two banks of 30 tall tubes were each mounted on circular motorised carousels. The role of these was to rotate each tall tube in turn into a station where automated procedures could take place. Cooled water for attemperation was supplied to individual jackets from a reservoir located in the centre of each carousel. After adding the pitching yeast slurry and raising the bottom containers, fermentations were initiated by adding the wort. This was metered in automatically using a dosing pump. During collection, the wort was aerated in-line by sparging with compressed air. 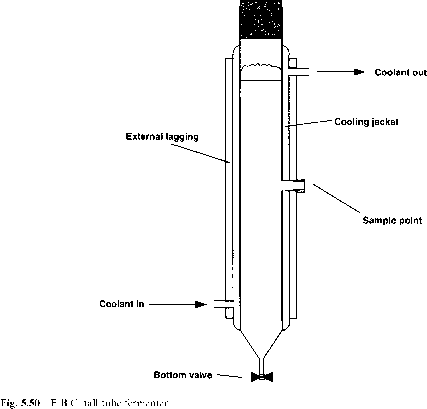 When the fermentation was in progress samples were removed automatically, at selected time intervals, using a needle and tube arrangement driven by a two-step motor. Samples were delivered into evacuated 10 ml tubes held in racks. Preservation of samples of partially fermented wort in the interval between removal from the tall tubes and subsequent analysis was accomplished by a combination of storage at low temperature and addition of lOOOmgl 1 copper. At the end of fermentation, the tall tubes were cooled to 5°C to encourage yeast sedimentation and green beer was removed from the bottom-located drain tube. The yeast crop was recovered from the bottom stainless steel container and could be transferred directly into a centrifuge, after which treatment the size of the yeast crop was measured by weighing. Empty tall tubes were cleaned by successive treatments with detergent and hot demineralised water, introduced into the top of each tube via the carbon dioxide exhaust line. During this treatment, the bottom container was replaced temporarily with a cup containing a bottom drain. A further incarnation of the automated E.B.C. tall tube has now been developed, also at the Carlsberg Research Centre in Copenhagen (Skands, 1997). This comprises eight pairs of 2 litre stainless steel tubes with automatic sampling and logging facilities. In this case, full and individual control of temperature profile, wort oxygenation and pressure is provided. A less sophisticated tall tube-type fermenter was described by Briggs et al. (1985). These were used as part of a six-line microbrewery designed to produce a brew-length of approximately 3.5 litres of hopped wort. The fermenters consisted of stainless steel cylinders, 87 cm in length and with an internal diameter of 7.7 cm, giving a total capacity of approximately 4 litres. The cylinder ends were sealed with detachable stainless steel discs. The top disc was perforated by a number of hygienic fittings, which allowed aseptic removal of samples, gas rousing and escape of carbon dioxide. 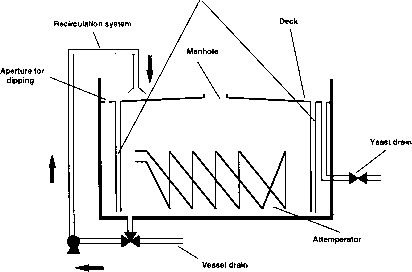 The exhaust gas escape valve could be sealed to allow pressurisation up to 2barg. There were no facilities for attemperation of vessels, other than location in a temperature-controlled room.